This is the "Penguin English Library Edition" of "Bleak House" by Charles Dickens. 'Fog everywhere. Fog up the river, where it flows among green aits and meadows; fog down the river, where it rolls defiled among the tiers of shipping, and the waterside pollutions of a great (and dirty) city. Fog on the Essex marshes, fog on the Kentish heights. Fog creeping into the cabooses of collier-brigs...' As the interminable case of Jarndyce and Jarndyce grinds its way through the Court of Chancery, it draws together a disparate group of people: Ada and Richard Clare, whose inheritance is gradually being devoured by legal costs; Esther Summerson, a ward of court, whose parentage is a source of deepening mystery; the menacing lawyer Tulkinghorn; the determined sleuth Inspector Bucket; and even Jo, the destitute little crossing-sweeper. 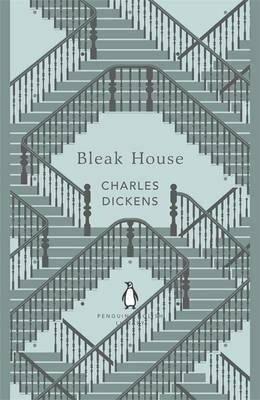 A savage, but often comic, indictment of a society that is rotten to the core, "Bleak House" is one of Dickens' most ambitious novels, with a range that extends from the drawing rooms of the aristocracy to the poorest of London slums. "The Penguin English Library" - 100 editions of the best fiction in English, from the eighteenth century and the very first novels to the beginning of the First World War.